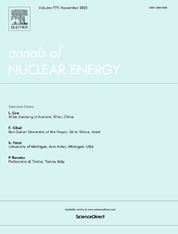 Annals of Nuclear Energy provides an international medium for the communication of original research, ideas and developments in all areas of the field of nuclear energy science and technology. Its scope embraces nuclear fuel reserves, fuel cycles and cost, materials, processing, system and component technology (fission only), design and optimization, direct conversion of nuclear energy sources, environmental control, reactor physics, heat transfer and fluid dynamics, structural analysis, fuel management, future developments, nuclear fuel and safety, nuclear aerosol, neutron physics, computer technology (both software and hardware), risk assessment, radioactive waste disposal and reactor thermal hydraulics. Papers submitted to Annals need to demonstrate a clear link to nuclear power generation/nuclear engineering. Papers which deal with pure nuclear physics, pure health physics, imaging, or attenuation and shielding properties of concretes and various geological materials are not within the scope of the journal. Also, papers that deal with policy or economics are not within the scope of the journal. Please read these guidelines for papers submitted to Annals which deal with computer codes and simulations.